Landscape Structures has taken the most popular Netplex components and added new opportunities for height that everyone can enjoy! Offers height, accessibility and visibility with lots of climbing, spinning, bouncy fun and plenty of places to hang out. Choose from four preconfigured Super Netplex designs. Enjoy the spectacular view from the towers, while those watching below have perfect sightlines to all the activity. FitCore™ Extreme — Create your own custom fitness course using combinations of 38 predesigned pieces. Each piece can also be a challenging obstacle for parkour or freerunning. The Centre is a complete play village with the Loft, Fire Station, and Market Cafe all connected by an elevated crawl tunnel. Landscape Structures has developed modular, concrete Facet Forms. From tunnels to benches, these modern shapes will bring your site into the now. Kids will be drawn to this collection of modular forms that is inspired by the natural geometries of geodes, minerals and other elements in nature. Facet™ Forms invite endless chances to climb and explore. Made from concrete, these cool and contemporary looking structures will withstand years of rugged activity. Tons of rocker styles available including fire engines, airplanes, horses and dinosaurs. These vivid DigiRiders™ use the potential of our DigiFuse® technology to breathe new life into a playground classic, the Spring Rider. The butterfly DigiRider™ is perfect for the 6-23 month or 2-5 year age group, while the rest are designed with ages 2-5 and 5-12 in mind. DigiRiders™ are the perfect choice whenever a dash of imaginative motion based play is needed! 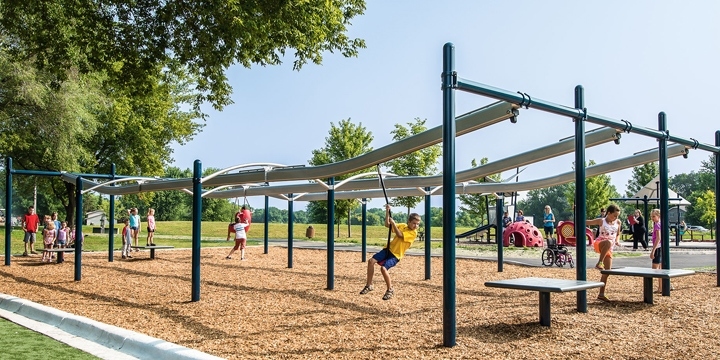 This multi-user commercial playground swing is one size fits all, from two kids to a multigenerational family. The Friendship™ Swing is a great way for siblings, parents and grandparents to enjoy time together. The Friendship Swing comes complete with its own swing frame or in an additional bay frame to add on to other swings. Landscape Structures new Smart Play Loft is designed for ages 2 to 5 with a fun whimsical house with a garden look and feel to foster creativity and imagination. Compact design offers 20 different interactive activities. Handrails lead small users up the steps and into a world of play, with a built-in find-it game, learning activities, lower level clubhouse and so much more! Landscape Structures new Smart Play Nook is designed as a unique play experience for ages 6 to 23 month olds with 20 different activities. 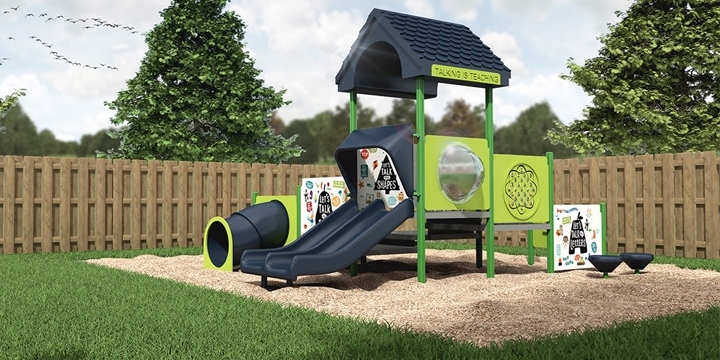 Sized just right for little crawlers and early walkers, this whimsical playstructure offers plenty of colorful activities with developmental benefits including sensory, cognitive, motor skills and social. Smart Play: Nook activities and messaging was developed with guidance from the National Head Start Association and Too Small to Fail, to help support whole-child learning across key developmental domains. Landscape Structures has launched the all new GeoPlex™ climbing panels for ages 5 to 12! GeoPlex can be transformed into a wide range of dynamic climbers, towers, towers with net combinations and post-and-deck attachments. These abstract, fresh designs come in many colors to create your favorite look – contemporary, geometric, organic and much more! Landscape Structures is excited to announce the much anticipated Global Motion™. The inclusive play Global Motion™ rotating climber invites an entire group to climb aboard and go for an orbital ride. Kids can take turns climbing multiple nets, socializing on the two levels and pushing the globe. This freestanding rotating climber packs in plenty of fun activities— climbing, turning, running, gathering and socializing. Two openings on the bottom let kids easily enter and exit and the height of the lower deck is appropriate for wheelchair transfer, offering inclusive play opportunities. 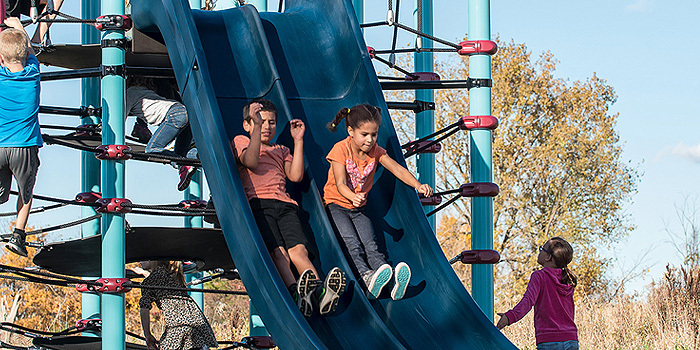 Kids of all abilities will appreciate the energetic ride and parents will appreciate its progressive resistance mechanism – Landscape Structures’ patent-pending technology that keeps Global Motion™ at a fun, yet controllable speed. It’s just another way Landscape Structures continues to lead with innovation. 20 exciting activities including climbing nets, slides and play panels all in a compact size of 40 x 46. 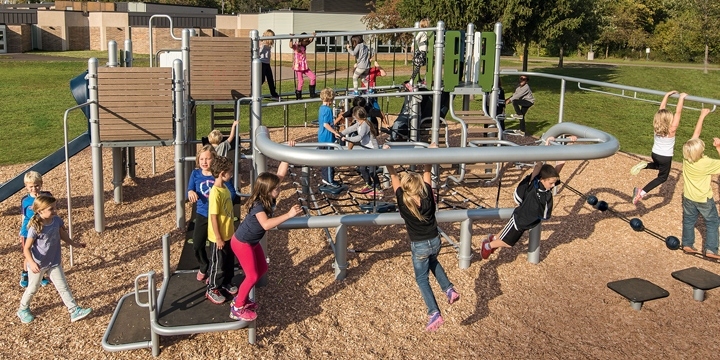 Designed for fun and challenges that promote physical development and strategic thinking, while also creating hangouts where kids can take a break and connect with others. 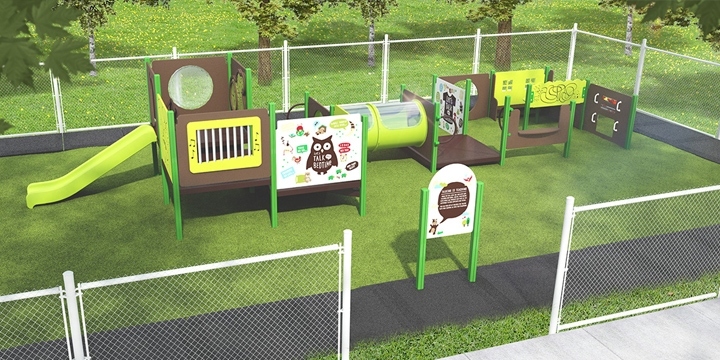 Multiple entry points and plenty of activities, this accessible playstructure can accommodate a whole class at once. 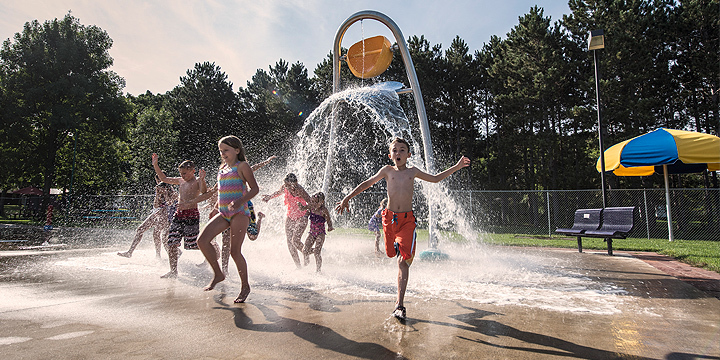 The compact size requires less space and surfacing material than typical playgrounds, resulting in a lower total investment. SkyWays™ from Landscape Structures is designed to meet the demands of both heat and sun. 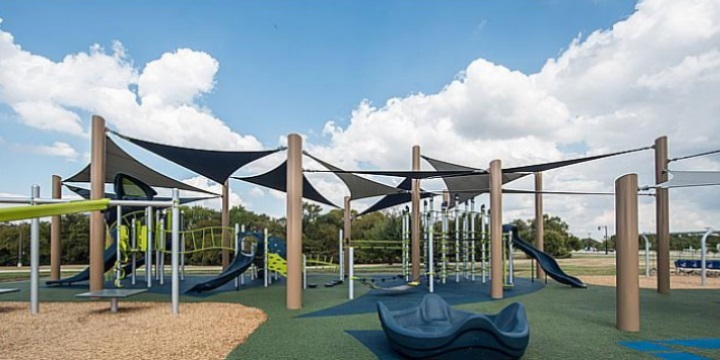 SkyWays™ provides the largest break from the sun and is designed to block up to 97 percent of the sun’s harmful UV rays and keep playground temperatures up to 30 degrees cooler. Even available with a cool misting option, for the steamiest of play days. 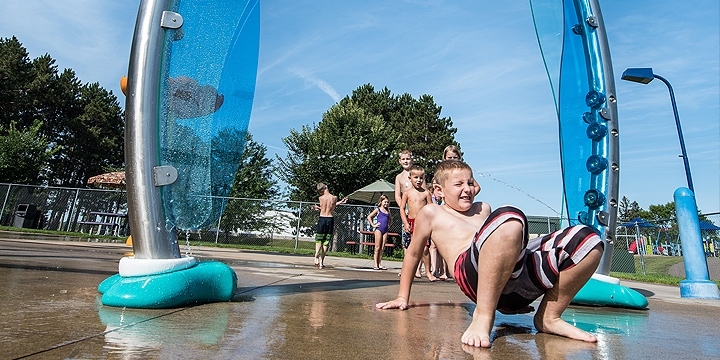 The VersoSplash™ provides an unexpected splash. You think you know what’s going to happen, then surprise! The bucket dumps in the opposite direction while the water spills forward. It’s as fun to watch as it is to stand underneath. 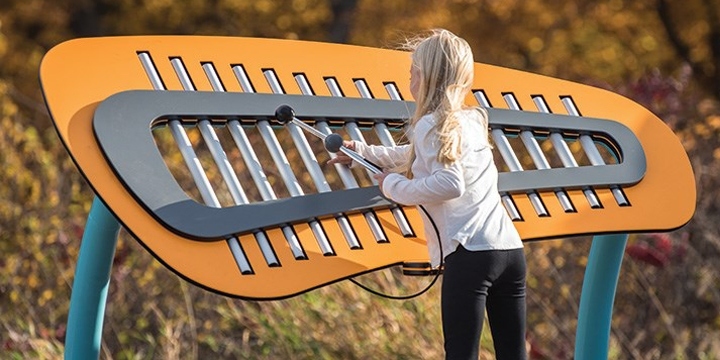 Landscape Structures has launched an outdoor collection of chimes, metallophones and drums that encourage all ages to discover the gift of music together. See how low you can go with the elegant WaterLimbo™. By taking a familiar activity and giving it a watery twist, Aquatix has created the limbo game of tomorrow. Both crawlers and early toddlers will appreciate the graduated levels that lead to just-right activities and colorful interactive opportunities. DigiFuse™ capabilities offer enhanced graphics that encourage language-rich interactions with caregivers. Developed in partnership with Too Small to Fail’s “Talking is Teaching: Talk, Read, Sing” Campaign. Zip lines have become the fastest growing recreational sport in the world. 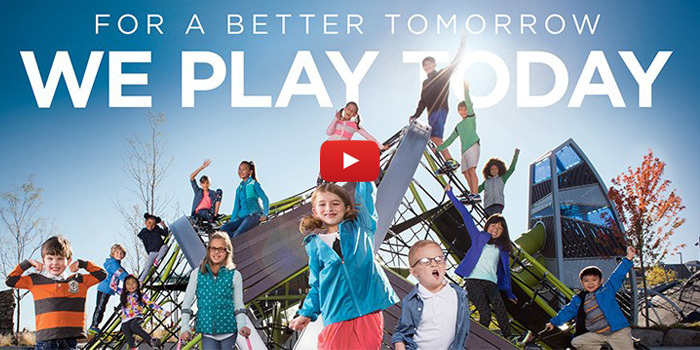 Now ZipKrooz™ brings the adventure to the playground in an exciting, safe way. Unlike other playground zip lines, ZipKrooz is an ultra-smooth two-way ride, eliminating the need to walk the seat back to the start. Built in elevation helps riders gain momentum at the beginning, then slow down at the end. With its unique 4-wheel trolley system and comfortable seats, ZipKrooz™ is engineered for exceptional quality, comfort and safety.